I do love a good bold wallpaper print but this is something completely different. Artist Beth Katleman has taken wallpaper to a new level with her collection named “Folly”. 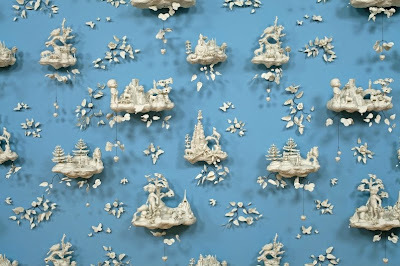 The design is a three-dimensional rendering of the traditional Toile de Jouy wallpaper. 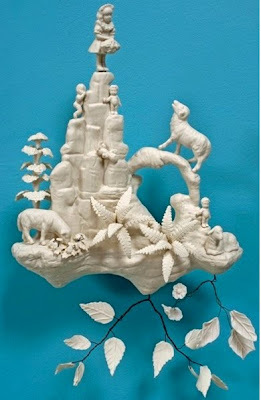 Cast in ceramic, she has created a wall of exquisite Asian-inspired pavilions, occupied with fine kitschy figures. Katleman created 12 separate installations of Folly, the first of which sold for $200,000 through Todd Merrill Studio Contemporary to a private Australian collector in 2010. “Folly” was exhibited at the Museum of Arts and Design in New York in 2011 and will be on view at The National Trust in the U.K at Claydon House in 2012. I think I’ll be off to have a closer look for myself. The installations are defiantly enchanting and although not for everyone, would certainly provoke conversation around the dinner table. A short but sweet post; I’ve just come across this fabulous chair on a blog called Jeri’s Organizing and Decluttering News. 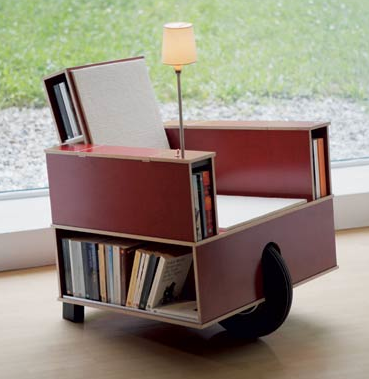 I want one of these in my life! The bookinist from Nils Holger Moormann costs 2,187 euros. I better start saving my pennies!